Black and white poster. Title at top of poster. Visual image is a b&w photo reproduction featuring an older woman. She stands with her arms crossed. Caption below photo acknowledges the difficulty of talking about drugs and sexual behavior in Hispanic families and stresses the importance of speaking openly about these subjects as children are at risk. Picture caption: Es difiÌcil para nuestras familias hablar acerca de las drogas y el sida ... Nosotros podemos ayudarle a comenzar la conversacioÌn. LlaÌmenos para recibir una guiÌa de informacioÌn. Old woman with arms crossed. 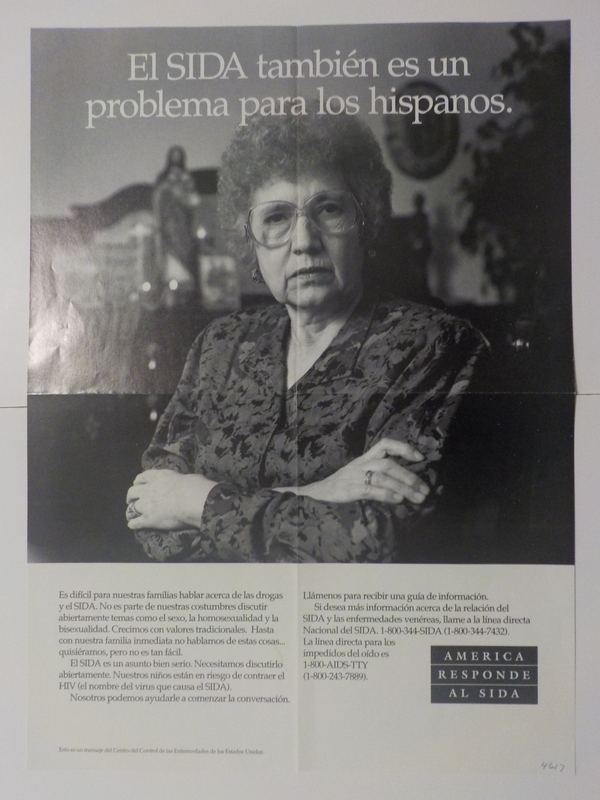 Description about hispanics/AIDS. D/E untrimmed. Centers for Disease Control and Prevention (U.S.). Business Responds to AIDS.. Labor Responds to AIDS..
National Center for Chronic Disease Prevention and Health Promotion (U.S.). Division of Reproductive Health.. United States. Agency for International Development. The 1998 Paraugay RHS covers: fertility, contraceptive use, young adult sexual experience, maternal and child health services, and intimate partner violence. n=3,598 women 15-44.